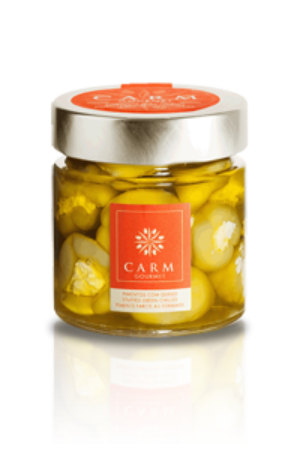 We selected one of CARM’s most mature oils to stand up to these mildly spicy green peppers. During harvest, between September and October, only the peppers of the desired size are selected, cored and put in brine.The peppers are then drained, washed and stuffed with half-curdled cow’s cheese. The mingling of the peppers and cheese produces an appealing Mediterranean flavor. Excellent as an appetizer, addition to a salad or accompaniment of a main course.